Schleißheim Palace has one of the few baroque gardens that have remained virtually intact. Its basic structure with the canals, designed by Henrico Zuccalli, was already in place by 1684, and by 1705 the whole bosket area was completed. From 1715 the parterre and cascade were constructed from plans by Dominique Girard, a pupil of Le Nôtre, many high-baroque refinements were added and the main axis acquired its striking impression of depth. The central canal dates from 1781. In 1865 comprehensive reconstruction work was carried out by Carl von Effner. 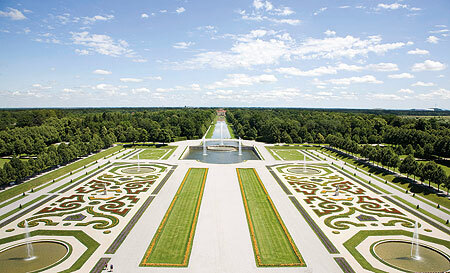 The palace garden was badly damaged in 1945 and has been gradually restored: the most recent measure, in 1999, being the renovation of the cascade.